It’s been awhile since my last update. I did not write about the rest of my Mexico adventure. For this I am sorry – it was a wonderful time, and I realized that I have many reasons to be content with my life. It was powerful, but also awkward in a “well what do I do now?” kind of way. Turns out I travel. That is usually the answer in my life. I go somewhere else and see what there is to see. In researching my family history, I learned that we have ancestry in Belgium. I have never had a reason to go to Belgium, though my Dad and I have talked about visiting for a couple of years now. Then I learned a friend of mine was going to Brussels because a mutual acquaintance had moved to Belgium and was having a housewarming. Student loans will be there till I die. I will never be debt free. And see what there is to see? I presented the trip as a family history project, which is how I convinced my Dad to help me financially with getting to Belgium on short notice. I’ve done it once before – I went to London to search out the woman who corresponded with my Grandpa during World War II. That trip did not yield fruit – all I got was a cool National Archives ID and I scared a man who probably thought I was the immigration police. This time I would do better, I thought. I have a whole binder and a bunch of useful documentation done by an extended family member. 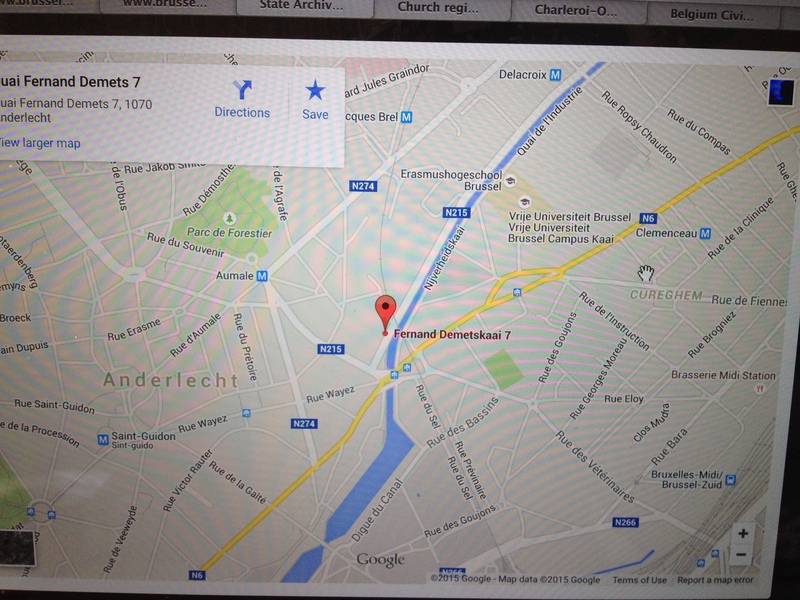 I was going to find Charleroi, Belgium, and explore the homeland of my ancestors. I surprised my friend by asking if I could crash the housewarming party – though naturally I offered to help with the set up and such. She agreed. Dad agreed. I agreed, and off I went! 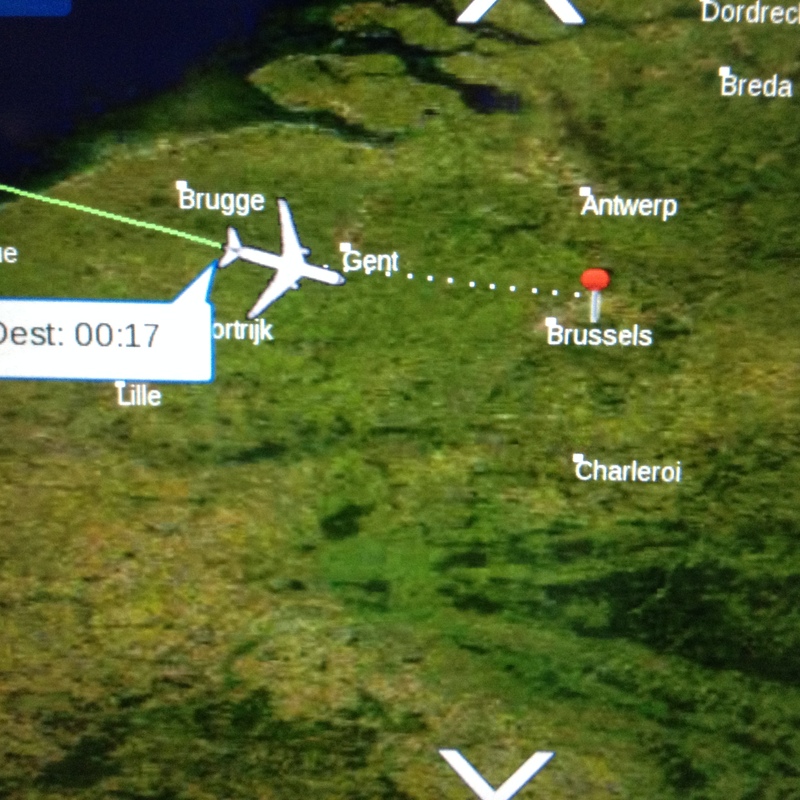 And so it was I arrived in Belgium on minimal planning – the closest thing I’ve ever done to just up and going somewhere. A weekend bag, my passport, and a giant binder full of photocopies. I arrived with the dawn. My first impression was good – a mix of village and city. My hotel was in Brussels, and a very good deal for a place near the EU Parliament buildings. It all went by in a bit of a blur, which I think is true for all airport to hotel transfers. Everything blurs in highway and the backside of buildings. On the drive over, my Taxi driver Mr. Kiss (no joke) gave me a brief introduction to the city. It was a good opportunity to warm up my French, as I haven’t spoken it in some time. We chat about the transformation of the capital, the new and old architectures vying for attention and space. He offers to be my driver for my stay, but I demure. I plan on using trains and the metro for the bulk of my travel. Also I am on a strict budget, and the luxury of a personal driver is not one in which I care to indulge. I decided that, given the short nature of this trip, I needed to hit the ground running. So upon arrival I immediately connected to the wifi and found the hours for archives. 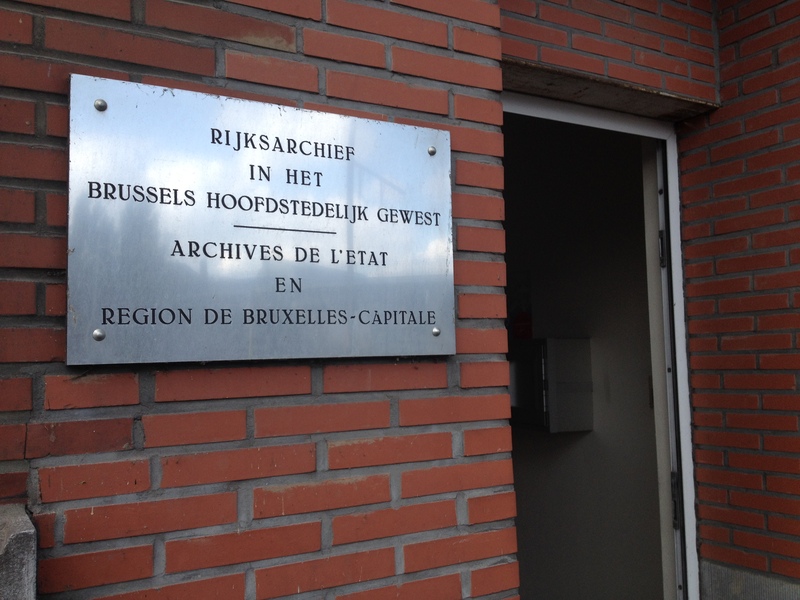 There are several branches of the archives in Belgium, with several in Brussels, so I was a little intimidated. Luckily, through some quick research and cross-referencing, I found the archives which would most likely have information on the birth records for churches in the Charleroi area. I took photos of Google maps for my phone (which did not work in Europe) so I could find the metro, and then the archives. I downed a bottle of water, and headed out. A good use for the cell phone when maps are not readily available. I could feel jetlag gnawing away around my edges even in the morning – a consequence of not sleeping well on the plane. But there was no time for drooping! I was on a tight schedule. Impression of Belgian metro – relatively clean but expensive for a metro. More expensive than Paris, at least (unless Paris has upped the fares for single tickets). With increasing bleariness I locate the Archives. They are closed for lunch. This was not mentioned on the website. I sit out in the sun by a canal and drink caffeine. This area of town seems more workaday than tourist, and there is a air of slight neglect on everything. Beer bottles and trash are tucked into corners of broken concrete, and there are the bits of graffiti here and there, but the streets and the canal waters are clear. I’m stalling out on the bench. The pleasantly warm sun is not encouraging me to stay awake. It’s reminding me how much I love afternoon naps. There is nothing to do in the immediate area – no park or monument to distract me. No grocery or gift stores. Just a series of dark brown brick residencies built above halal shops and travel agencies. I can’t play games on my phone because I need to preserve the battery for looking at maps (I don’t plan on getting back to the hotel until late). Now dragging instead of skipping along, I manage to make it through the hour and return to the Archives building. It is now open, and I drop off my belongings in a locker and get buzzed in. The building is low and cool. Most of the lights are off, and sunlight filters through windows along the top of the back far wall. There is no one in the space under fifty (and that’s me being generous). There does not appear to be an information area, so I approach a white-haired man behind the only counter visible. I ask about birth records for Charleroi (I’m super proud of myself for looking up the words “birth records” in French), and show him my binder. After some back and forth, I learn that there is a gentleman going through microfilm who might be able to help me. I also learn that there is not a soul in the building who speaks a lick of English. Normally this would not bother me – I can muddle through enough French to get my ideas across. But this would require a highly specialized vocabulary set that most French courses would not think to teach. There is no chapter in my high school (or college) French texts that contain “Useful vocabulary for researching lineage.” I looked up some key words I thought would be useful, but beyond that I’m stuck using context clues and hoping for the best. A tall man with halitosis shows up and takes an interested look at my binder. I point to Charleroi, and then we’re off in the microfilm. It’s exciting – I haven’t used microfilm since I was a nerdy elementary school kid at the library. Microfilm has such a lovely old-timey feel to it. It won’t tell you anything itself – you must look for your information. You have to know what you want before you think to go scrolling through those rolls of film. Granted, it’s more time consuming and finicky, but I can appreciate that in research. In the process of going through the film on the monitor, we (me and tall man) collect a curious collection of aged researchers. They look at my binder, and talk among themselves since I’m falling deeper into jet lag stupor and admitting that my French is falling along with me. They ask why I did not call ahead, why I decided to just visit instead of communicating through e-mail. I explained that the fun is in the doing. Anyone can just write back and forth these days. I like to put my hands on things. I don’t think this impresses them – I detect a note of something like bafflement. They’re totally confused as to what I think I’m doing, or why I’m going about it in such an old-fashioned way. Don’t they understand that the point is to go out into the world to find things? We don’t find anything. The records for the registry in my binder do not reveal anyone with my surname from the towns listed. I’m too tired to follow it fully, but it sounds like there is some debate about the spelling. Monfort vs. Montfort. Perhaps there is an error in the immigration papers? The identification of the town? Am I staying around for the week? No, just the weekend. The nice woman who has been chatting with me shakes her head. The archives are closed over the weekend. It’s a pity I’m not staying longer, but perhaps I could e-mail them my information when I get back to the United States. They’d be willing to help me search. Ah, e-mail. Traditional overseas correspondence these days. Not hands on, but long distance requests. There’s not much else I can say to that. I know that I interrupted all of their projects. Seriously, they were all deep in their own work when I showed up. The tall man with bad breath said he could take a few minutes to help me. The lookers-on just stopped what they were doing. And then the cheerful American with her fat binder yielded no results, and their projects needed to resume. I shoved all self-centered thoughts deep down so that they wouldn’t pop out (they were very vain thoughts about fuddy-duddies and no sense of the moment). It’s 3pm. Time to head out to meet my friend and the acquaintance. 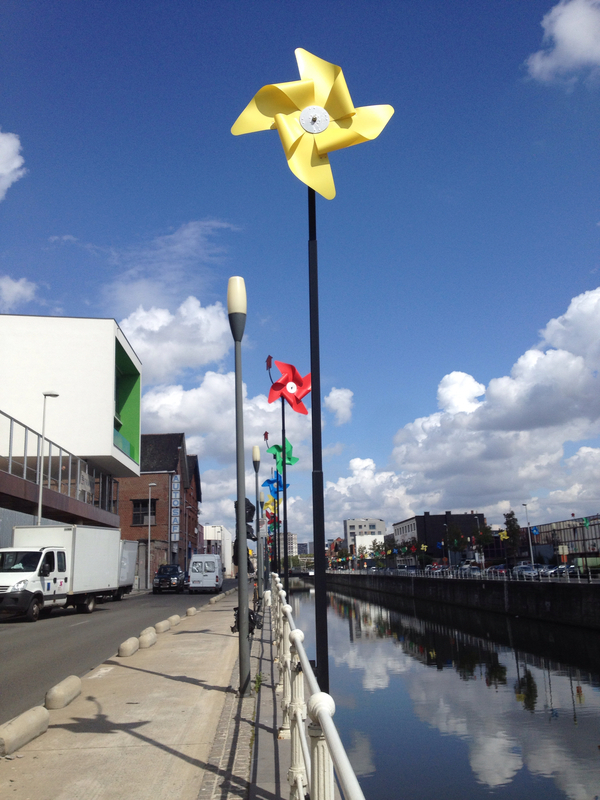 This Post was posted in Anecdotes, Communication - ESL and Otherwise, Places and tagged Archives, Belgium, Brussels, Europe, Family Research, Geneology, jet lag, microfilm, Overseas travel, Quick Trips, research, Travel, Weekend Getaways. Bookmark the permalink.